**The “Cowboy” Hobbles are designed so if desired you can put the doubles on the front feet and the single on a back foot and hook them together. Made out of Latigo, Harness or Skirting Leather & Lined w/Latigo Leather. Made out of skirting leather and lined with soft latigo leather. 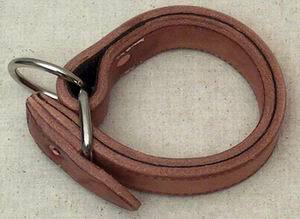 “Figure 8” Style Hobble $65.00 Made out of harness leather.